Masako Wakamiya is a vibrant, self-described chatterbox who just launched her first smartphone app. Oh, and she's 81 years old. She says she felt compelled to do something after noticing a shortage of fun apps aimed at people her age. "We easily lose games when playing against young people, since our finger movements can't match their speed," Wakamiya told CNN. The retired banker asked a bunch of people to create games for seniors, but no one was interested. So she took matters into her own hands and achieved something many people half her age haven't done. "I wanted to create a fun app to get elderly people interested in smartphones," she said. "It took about half a year to develop." Wakamiya started using computers at age 60 when she was caring for her elderly mother and finding it difficult to get out and socialize with friends. Back then, computers weren't so user friendly. Speaking at a TEDx conference in Tokyo in 2014, an energetic Wakamiya recalled how it took her three months to set up her computer and get online. "My face was covered in sweat and tears," she said. She joined what's known as a "silver club" to learn how to use the internet and connect with other senior citizens online. "I talked with a lot of silver guys," she says with a laugh. Wakamiya is single and doesn't have any children. 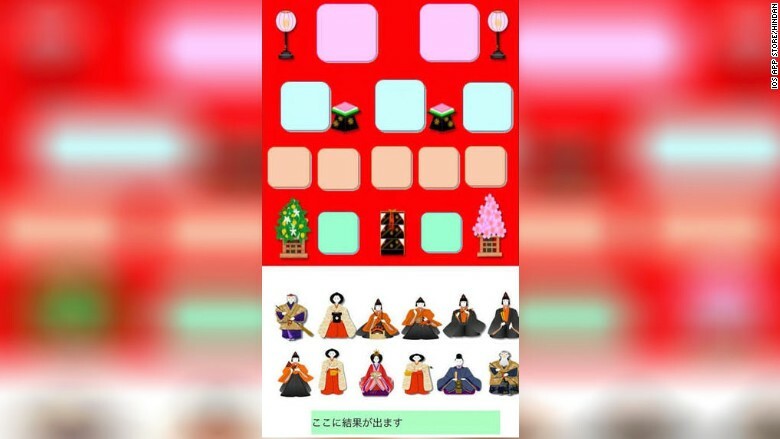 Her app, Hinadan, is an iOS game based on Japan's traditional festival Hinamatsuri, or Doll's Day, which is celebrated in early March. During Hinamatsuri, ornamental dolls representing the emperor and his entourage dressed in traditional clothing are displayed in a specific arrangement. In Wakamiya's app, users have to decorate the dolls and get them in the right position for Hinamatsuri. She calls herself a technology evangelist and even wrote her own PC textbooks because she found the options available to her were too boring. "You don't have to be a professional," she said. "If you have creativity, if you have a playful mind, you can create teaching materials." Wakamiya now gives computers classes and blogs regularly in Japanese (and English with the help of Google's translation tool). Hinadan was her first app, but it likely won't be her last. "I have lots of ideas and want to create new apps, but my programing skills are poor," she said. "I need more time to develop them." Correction: An earlier version of this story misstated the length of time it took to develop the app.